This is an election year for IEEE Canada. We encourage you to vote when you receive your ballot from IEEE. KEITH B. BROWN, PH.D., P.ENG. Keith Brown is a senior engineer with Ontario Power Generation's Nuclear Division and an adjunct professor of electrical and computer engineering at Ryerson University, Toronto. He has performed research and development in short-range radio frequency communications and also had the unique and rewarding experience of having served 15 years with the Canadian Forces; retiring from active duty in 2003. He holds degrees in mathematics and physics, advanced degrees in electrical and computer engineering (MSc'99, PhD'03), and a diploma in business management, all from the University of Alberta. He has published in excess of 23 technical documents and maintains a keen interest in the application and development of advanced instrumentation. Dr. Brown is a Senior Member of the Institute of Electrical and Electronics Engineers, a Member of the American Society of Mechanical Engineers, and a licensed professional engineer in both Alberta and Ontario. IEEE Ethics and Member Conduct Committee, Region 7 Hearing Panel Delegate, 2006-08. RAB Section Sustained Membership Growth Award (As Section Chair), 2005, 2004. It is my goal to bring more energy and enthusiasm to the region, its members and volunteers as Region 7 Delegate-Elect/Director-Elect. I am confident I can serve the needs of our members based on my industry experience as well as my IEEE involvement, having lived and volunteered in two of the three geographical areas within IEEE Canada. IEEE Canada has been very successful - but we can do better. My varied experience and insight makes me ideally suited to represent Region 7 as Delegate-Elect/Director-Elect and I would be honored to serve in such a capacity. Maike Luiken obtained her Staatsexamen in Mathematics and Physics from the Technical University in Braunschweig, Germany (1979) and her Ph.D. in Physics from the University of Waterloo (1982).Maike has over 30 years of professional experience in teaching, research and educational administration, community and network building and especially in connecting industry partners, government agencies and researchers in advanced technology projects. She has worked in both the public and private sectors in Canada, the USA and Germany.Maike is a founder of the Ottawa Photonics Research Alliance (OPRA), the Ottawa Wireless Research Alliance (OWRA) and is a member of numerous boards including Unmanned Vehicle Systems (UVS) Canada.Her areas of expertise include sustainable development, advanced data communications, leadership and management of research projects in College and University environments, development of educational simulations and leading edge on-line learning modules.Maike is a SMIEEE and a Fellow of the Engineering Institute of Canada. Ottawa Section Volunteer Recognition, 2002-04. London Section Volunteer Recognition, 2007. IEEE members are at the forefront of science, technology and applications development and are vital to meeting our evolving technological and societal challenges - like global warming - and to enabling a sustainable future for all. Representing the interests of the IEEE Canada members, I will make our voice and concerns heard nationally and internationally. Marcelo Mota holds a Bachelor's degree in Electrical Engineering from the Federal University of Bahia, Brazil, and a Master degree in Business Administration (MBA) from the University of Warwick, England. He joined the Greater Toronto Airports Authority in 2001 and currently holds the position of Director, IT Programs. Marcelo has a total of 27 years of experience in the IT, Energy, Government, and Consulting industry. He was the Director of Business Development and Operations & Technical Support of a provincial information technology company. Prior to this, Marcelo spent 17 years at a large hydro company, holding the positions of Head of the Corporate Strategic Planning Division, General Manager of the Tenders & Contracts Department, General Manager of the IT Department, Regional Manager of the Metropolitan Area, and Head of a number of Engineering Divisions. He is also a Project Management Professional certified by the Project Management Institute. Educational Activities Board (EAB): Board Member, 1997. EAB Transnational Committee Chair, 1997-98. EAB Section Outreach Committee, 2003. Member and Geographic Activities Board (MGAB), Board Member, 1997. MGA Section/Chapter Support Committee, 1997. Publication Services and Products Board (PSPB), Board Member, 1997-98. Larry K. Wilson Transnational Award, 2008. IEEE Third Millennium Medal, 2000. There are eleven awards, seven for achievement and four for service, which will be presented at the IEEE Canada Awards Banquet on the evening of May 4, 2009 in St. John's during the 22nd annual IEEE Canada 22nd Canadian Conference on Electrical and Computer Engineering (CCECE09). Nominations for these awards closed on Nov. 30, your awards committee then ranked the nominations and proposed the recipients who were then approved by IEEE Canada. Wolfgang Hoefer, a Fellow of IEEE residing in the Victoria Section, is an Emeritus Professor at the University of Victoria. He is receiving the A.G.L. 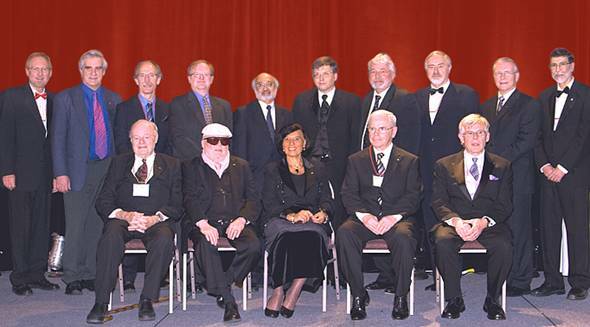 McNaughton Gold Medal (IEEE Canada's highest award - for exemplary contributions to the engineering profession) for pioneering research in microwave engineering, computational electromagnetics, and working with industry to develop practical time domain simulators. David Falconer, a Fellow of IEEE residing in the Ottawa Section, is a Professor of Systems and Computer Engineering at Carleton University in Ottawa. He is receiving the R.A. Fessenden Award (Telecommunications) for outstanding technical contributions to the area of data transmission in both wireline and wireless environments. William McDermid, a Fellow of IEEE residing in the Winnipeg Section, is the former Director of the High Voltage Test Facility at Manitoba Hydro. He is receiving the Electric Power Engineering Award for outstanding contributions to the development of rotating machine insulation testing. Ken (KC) Smith, a Fellow of IEEE residing in the Toronto Section, is an Emeritus Professor at the University of Toronto. He is receiving the Computer Engineering and Science Award for lasting technical and educational contributions to electronics for computing. Rajnikant Patel, a Fellow of IEEE and EIC residing in the London Section, is a Distinguished University Professor & Tier-1 Canada Research Chair at the University of Western Ontario. He is receiving the Outstanding Engineer Award for continuous outstanding contributions to the field of robotically enhanced surgery. Note: Commencing this year, this award is available to recognize technical excellence in fields other than telecommunications engineering, electric power engineering, or computer engineering or science. Lorry Wilson, a member of IEEE residing in the Southern Alberta Section, is President and CEO of Lorry Wilson & Associates. He is receiving the Industry Leadership Award for pioneering leadership in restructuring the electric utility industry in Alberta as the first CEO of the Alberta Power Pool. Note: this is the first year this award is being presented. Dave Kemp, a Senior Member of IEEE and a Fellow of EIC residing in the Winnipeg Section, is a consultant in project and risk management following a 35 year career with Manitoba Telecom Services. He is receiving the W.S. Read Gold Medal (for outstanding and sustained service to IEEE Canada and the Institute) in recognition of 45 years of dedicated leadership and service to IEEE at the local, national, and international levels. John Grefford, a Senior Member of IEEE and a Fellow of EIC residing in the Ottawa Section, is Program Support Officer with Defence Construction Canada. He is receiving the J.J. Archambault Eastern Canada Merit Award for dedicated and outstanding service to the IEEE Ottawa Section, IEEE Canada and EIC. David Whyte, a Senior Member of IEEE residing in the Toronto Section, is the Managing Principal of CDI Datacom Inc. He is receiving the M.B. Broughton Central Canada Merit Award for outstanding contributions to the IEEE Toronto Section and the IEEE Canadian Foundation over the past 25 years. Dave Michelson, a Senior Member of IEEE residing in the Vancouver Section, is an Assistant Professor at the University of British Columbia. He is receiving the E.F. Glass Western Canada Merit Award for outstanding contributions to the IEEE Vancouver Section and the IEEE Communications Society. We invite you to join us at the awards banquet in May to meet and celebrate with these accomplished individuals - for more details and information on purchasing tickets, please visit the conference website at "www.ccece09.org". The stability and performance analysis of dynamic systems affected by structured uncertainties usually requires the solution ofnon-convex optimization problems. A possible way to tackle such problems is to construct a family of convex relaxations which provide upper or lower bounds to the solution of the original problem. In this talk, convex relaxations for several robustness problems are presented by exploiting classical results and providing new insights on the theory of homogeneous polynomial forms. In particular, a general framework is introduced for dealing with positivity of forms via the solution of linear matrix inequalities, which are a special class of convex problems. Lyapunov analysis of uncertain systems affected by time-invariant or time-varying uncertainty, computation of the parametric robust stability margin, robust performance analysis for polytopic systems, are examples of problems addressed within the proposed framework. This talk is conducted by Dr. Graziano Chesi, IEEE Distinguished Lecturer, from the Department of Electrical and Electronic Engineering, University of Hong Kong. The Smart Grid promises a more reliable and energy efficient means of delivering power. The Zigbee wireless standard will be an integral part of the smart grid for communicating information from the utilities to the end-users. Until recently, Zigbee was primarily used in home automation and sensor networks where its low power and mesh capabilities were an ideal fit. Now with the Zigbee PRO and Smart Energy profile additions, Zigbee has found a new application in Home Area Networks (HANs) for managing energy. This standards oriented approach allows utilities to reduce a home's energy consumption and allows residents to be more aware of the energy they use. With a certification process in place, suppliers can build products that will integrate seamlessly with other products to form the HAN. Many of the 40 million smart meters that will be installed across North America in the next 5 years will have Zigbee radios built-in. The speaker, Chris Tumpach, is VP of Hardware Engineering at Rainforest Automation. Copper plating up to 5 oz. Rigid-Flex Circuits as thin as 5 mil. The tour at Canadian Circuits will allow us experience the full-cycle PCB fabrication process, current state-of-the-art and relevant technical challenges & solutions. The purpose of this workshop is to help IEEE members improve the teaching of and in pre-university schools (primary schools, middle schools and high schools). In this workshop, IEEE members will learn how to work with teachers of pre-university schools, and how to conduct hands-on sessions for these teachers on engineering topics. The teachers will then use these sessions on a regular basis with their own students. The workshop was a big success, with more than 100 participants from 15 different sections of Canada and other participants from China and Japan to learn and appreciate the objectives of TISP workshop in promoting the IEEE Pre-university programs around the world. Presentations were delivered by Dr. Ferial El-Hawary, Mrs. Christie Brown and Mr. Jan Novac (two top representatives of Quebec's Ministry of Education), and Mrs. Jacinthe Desrochers, teacher of Science & Technology at College Mont-Saint-Louis. Looking for a new job? Check out the following site! The IEEE Financial Advantage Program is pleased to announce that The Personal Insurance Company is now a provider of home and auto group insurance to IEEE Canada members. One of Canada's largest group insurers, The Personal insures members and employees of over 550 organizations and has over 650,000 policies in force across the country. The advantages of this voluntary benefit include preferred rates not available to the general public, exceptional service, and personalized protection. 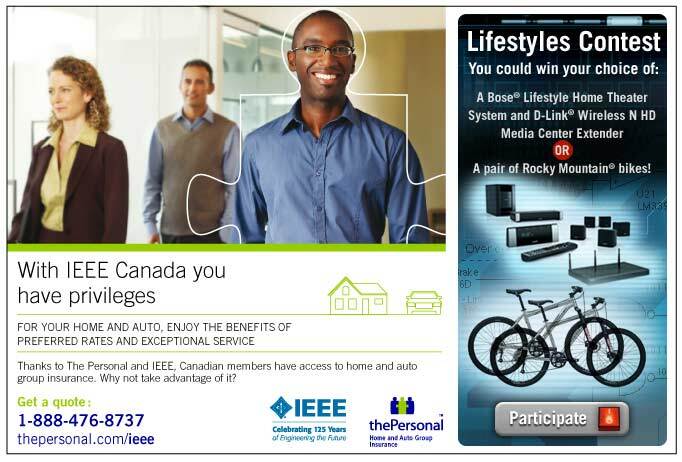 IEEE Canada members*, their spouses and dependants** are eligible for this new program. * One must be a member in good standing of the IEEE at the time of application and continue active membership in order to be eligible for the group rates. If over $10,000 in cash awards and an all expenses paid trip to exciting Toronto, Ontario are not enough reason to pay attention to this final call for papers then let me sweeten the deal! How about the opportunity to present your years of study and hard work to a new audience? How about the opportunity to meet your peers from across Canada? Check out your competition, make new friends and have some fun! How about the opportunity to connect face to face with Senior IEEE and Industry leaders? How about owning the bragging rights to participating in, and possibly even winning a National, Industry sponsored competition that highlights all the qualities Hiring Managers are looking for in graduate candidates? And if none of those reasons sound interesting, what about the satisfaction of proving your team, your school is NUMBER ONE! Friday June 12 will be the final day for submissions. Thank you to all participants who have already submitted projects! The Bahar Memarian from the University of Toronto and Neha Sharma from the University of Western Ontario have been named the 2009 recipients of the $2,500 IBM Canada Undergraduate Scholarships by CEMF. Both Ms. Memarian and Ms. Sharma will also receive a summer job opportunity at an IBM Canada facility. Ms. Memarian of North York, Ontario is a second year electrical engineering student at the University of Toronto. She believes in the positive impact women in engineering can have and says she has learned that "much creativity and diversity is added to a project when the group includes both male and female members." Ms. Sharma of London, Ontario is a third year electrical student at the University of Western Ontario where she is specializing in biomedical signals and systems. Her personal motto is "if you have an interest in something, don't let anything stop you." The Foundation is proud to present both Bahar and Neha with these well-deserved scholarships. Both are outstanding young women who are already demonstrating they will be leaders in the future and are excellent role models for others," says Suzelle Barrington, ing., CEMF president. Along with the $2,500 scholarship, both students are being funded by Foundation to attend the CEMF Annual Awards Luncheon in Montreal during the Annual General Meeting of Engineers Canada being held on May 22, 2009. The Canadian Engineering Memorial Foundation was founded in 1990 and honours the memory of the 14 women from École Polytechnique in Montreal who lost their lives on December 6, 1989. CEMF is committed to creating a world where engineering meets the needs and challenges of Canadians by utilizing the skills and talents of men and women alike, promoting engineering as a career choice with the generous support of Canadian corporations and many individual engineers from coast to coast. The Foundation provides a total of 13 scholarships at the undergraduate, Masters and PhD levels of study and promotes engineering as a career choice for women through their website, press releases, Annual Awards Luncheon and scholarship winner presentations to high school students. Bahar Memarian is an IEEE student member. "Closed-Loop MIMO Systems using Phase Steering"
"The Unshredinator: A Machine Vision Approach to Shredded Document Reconstruction"
"A Road Quality Measurement System using GPS Technology"
"Radio Frequency Identification: A Wireless Scale"
The field trip from April 30 to May 8 was organized by UBC IEEE Student Branch. The goal of this field trip was for students to become more familiar with the recent technologies being used in industry and university laboratories. UBC IEEE Student Branch executives contacted companies and IEEE student branches in Stanford University and University of California, Berkeley, to get in touch with laboratory technicians to arrange tours to their facilities. 24 students registered for the trip and registration fee was $600 for non-IEEE members and $500 for IEEE members. The following cities were visited: Seattle April 30-May 2; San Francisco May 2-3; San Jose May 3-8. The following companies, schools and locations were visited and tours to facilities were given by staff and engineers: Microsoft, Google, Sun Microsystems, Anritsu, Cisco, Intuitive Surgical, Lick Observatory, Intel Museum, Museum of Flight, Stanford University, UC Berkeley . Each company arranged a discussion panel with the students and their engineers. Students were all satisfied with the management and scheduling of the trip. The tours in all companies were also informative and gave students an overall picture of what to expect after graduation. The UBC IEEE student branch thanks UBC Applied Sciences, IEEE Canadian Foundation, and IEEE Vancouver Section for sponsoring this field trip. Also many thanks to students who oranized this event: Stanley Lee, Faye Limbo, Aman Bhatia, Salma Farzim, Edwin Jaury, Andy Tsai, Chen Yan, and Branch Chair (and able photographer) Aryan Navabi. Wolfgang J. R. Hoefer (LFIEEE) is Professor Emeritus of Electrical & Computer Engineering at the University of Victoria. He holds a Dipl-Ing. diploma from the RWTH Aachen (1965), and a D.Ing. degree from the University of Grenoble (1968). He joined the University of Ottawa in 1969 and was Chair of Electrical Engineering from 1978 to 1981. In 1992 he joined the University of Victoria as a Professor and NSERC Industrial Research Chair in RF Engineering, heading the Computational Electromagnetic Research Laboratory (CERL) until his retirement in 2006. He also held visiting appointments at the Universities of Grenoble, Rome, Nice, Perugia, Munich and Duisburg, the Ferdinand Braun Institute Berlin, the ETH Zürich, AEG-Telefunken, CRC Ottawa, the Institute of High Performance Computing in Singapore, and Georgia Tech. He is the Founder and President of Faustus Scientific Corporation since 1996. Dr. Hoefer's research in microwave engineering and computational electromagnetics has shaped the technologies and design tools for analog microwave and high-speed digital communication systems. He advanced the CAD of planar and E-Plane circuits, pioneered the application of Finite Difference Time Domain (FDTD), Transmission Line Matrix (TLM) and Multi-resolution Time Domain (MRTD) methods in microwave circuit design, and spearheaded the development of modern time-domain TLM electromagnetic field simulators. His modeling technology forms the basis of the EM Simulator MEFiSTo, commercialized by Faustus Scientific Corporation. Dr. Hoefer is an IEEE Life Fellow (F'91, LF'06), and a Fellow of the BC Advanced System Institute (1992), the Royal Society of Canada (2003), and the German Academy of Science and Engineering (ACATECH, 2007). He was Associate Editor of the IEEE MTT Transactions (1998-2000), Chair and Co-chair of the MTT-15 Technical Committee on Field Theory (1989 to 2004), and an IEEE MTT Distinguished Microwave Lecturer (2005-2007). Among other distinctions he received the Peter B. Johns Prize (1990), the ACES Mainstay Award (2004), the IEEE MTT Distinguished Educator Award (2006), and an honorary doctorate (2007) from the TU München, Germany. Mr. David Falconer (LFIEEE) is Professor Emeritus and Distinguished Research Professor in the Department of Systems and Computer Engineering at Carleton University, which he joined in 1980. He received the BSc degree in Engineering Physics from the University of Toronto in 1962 and the S.M. and Ph.D. degrees in Electrical Engineering from M.I.T. in 1963 and 1967 respectively. After a postdoctoral fellowship at the Royal Institute of Technology, Stockholm, he was with Bell Laboratories, Holmdel, New Jersey from 1967 to 1980. During 1976-77 he was a visiting professor at Linköping University in Sweden. He was Founding Director of Carleton's Broadband Communications and Wireless Systems (BCWS) Centre from 2000 to 2004. His research career has mainly focused on adaptive signal processing for wired and wireless modems, and currently, next-generation broadband wireless communications systems. He and his over 70 Carleton masters and doctoral graduates have made significant contributions to advanced wireless systems though participation in TRIO and CITR, the IEEE 802.16 wireless MAN standards group and in the European Union WINNER Project. He was the elected Chair of Working Group 4 of the Wireless World Research Forum (WWRF) in 2004 and 2005. Dr. Falconer received awards for papers published in IEEE Communications Transactions and IEEE Vehicular Technology Transactions in 1983, 1986 and 1992. From 1981 to 1987 he was Editor for Digital Communications of the IEEE Transactions on Communications. He was Vice Technical Chair of the IEEE VTC Conference in 1998, Honorary Conference Chair of the CNSR Conference in 2007, and Executive Chair of the IEEE WCNC Conference in 2008. He received the 2008 Canadian Award for Telecommunications Research and a 2008 Recognition Award from the IEEE Technical Committee on Wireless Communications. The TIC-STH conference is an international forum for state-of-the-art research across a broad spectrum of the IEEE science and technology fields of interest. The format of the conference is several parallel Symposia focusing on the advanced scientific and technological problems, especially of the interdisciplinary nature. The Symposium provides an opportunity to Publish Lengthier Papers - Up to 6 (six) Pages With No Extra Fee. Additionally, high-value tutorials are included with registration. Your Conference Advisory Committee, CONAC, is seeking RFPs from Sections interested in hosting the Electrical Power & Energy Conference (EPEC) in the fall of 2010. To obtain a copy of the RFP contact A. Kash Husain at a.husain@ieee.org The RFP is due April 20th, 2009. Program Chair: Om Malik maliko@ucalgary.ca. The IEEE Power Engineering Society General Meeting brings together an international group of practicing engineers, operators, planners, policy makers, economists, academics and others with interest in the field of electric power and energy. It thus provides an exceptional venue for learning about the latest developments in all aspects of electrical power and energy, and discussing issues with experts in related fields from all over the world. The conference will begin with a timely and valuable plenary session and will also include tutorials on a number of up-to-date topics in this area. Paper, panel and poster sessions will be scheduled, with top papers drawn from all committees to be featured in Super Sessions. For additional information about the meeting visit the website http://ewh.ieee.org/cmte/PESGM09. Find information about these and all IEEE Conferences in Canada here.